(1) Things which I have read and enjoyedI - did not read a whole lot on holiday. Playing Hard Ball in which English cricketer Ed Smith gets into baseball and goes to spring training with the NY Mets. I really enjoyed this book exploring the similarities and differences between two sports that I love - but, I suspect it will work better if you’ve gone from cricket into baseball than it will if you’ve gone the other way round. It’s also a little weird, because it was written in around 2003 and so it mentions all these players I hazily remember from Test Match Cricket 12 years ago (oh, yeah, Alex Tudor, he was a guy), and have heard of in baseball but who obviously retired before I got into it. It’s also weird because it’s written before the PED era in baseball broke apart, and so it assumes that offensive hitting is The Thing - and now it’s not. Slaughterhouse Five - Kurt Vonnegut. Like, finally, I know. It really packs a punch, for all it’s a slight volume of a thing. I’m into surreality in war literature. Code of the Woosters - PG Wodehouse, for London Book Club. It didn’t make for a great book club book, because there’s not a whole lot to talk about, but I loved the excuse to re-read about Bertie’s adventures in cow creamer theft. (2) Things which I have watched and enjoyed I didn’t actually make it to the cinema in June, between holidays and work, which is really odd for me. I watched the recent Cinderella on the plane, which was perfectly nice fluff. But: if you’re in New York, you should buy, beg, or steal a ticket to see American in Paris on Broadway, because it is made of magic and Gershwin music. No one choreographs falling in love like Christopher Wheeldon, and this show is a joy. (If you’re in London, you should go see The Beaux Stratagem at the National Theatre for £15. Technically I saw it in July, but it was ace, and the theatre was at least a third empty, so you will be able to get a seat, and it’s a steal). And a piece about how dull books are dull (and how David Mitchell is great). 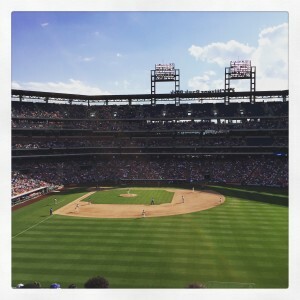 how I spent a lot of the first half of the month… this is the San Francisco Giants playing the Phillies in Philadelphia. (5) In the pile for July I’m half way through Rachel Held-Evans’ Searching for Sunday, which I am really enjoying, and about an eighth of the way into the new Neal Stephenson, Seveneves. That might have to go on the back burner for a bit as I’m going to be reading Siri Hustvedt’s The Blazing World for book club. If I have time after that I’m onto All the Light We Cannot See and Simon Armitage’s Walking Away. At the theatre I’m looking forward to the Dutch National Ballet dancing Wheeldon’s Cinderella, and Edward Watson dancing with Wendy Whelan. I’ve also got Everyman at the National to look forward to, and my first Prom of the Year - Bryn Terfel as Tevye in Fiddler on the Roof.